The Steel Gömböc is our latest metal product, one with a particularly relaxing effect. This large Gömböc is ideal for powerful minds and visionaries, who have to solve problems on a daily basis. The Steel Gömböc is the perfect desk toy to help you to have fresh and new ideas. It is made of a very hard material, which is extremely robust and almost as heavy as bronze. 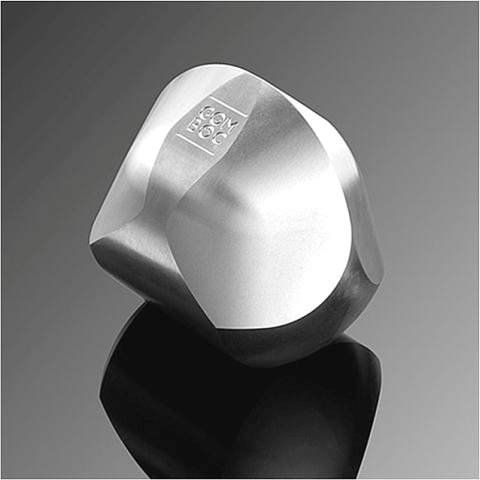 Our stainless steel the most ideal substance for an exclusive gift out of any pure design objects. Since its weight is close to the bronze model, it can move continuously for several minutes on a plain surface until it finds its equilibrium point. Steel Gömböc swings approximately 1.5 times longer than our Aluminium one. Choose our Steel Gömböc as a powerful and exclusive gift for your friends and partners!